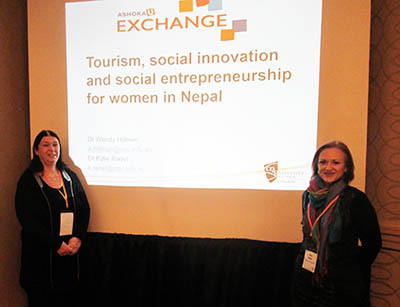 CQUni researchers Dr Wendy Hillman (left) and Dr Kylie Radel have developed a grounded theory analysis of seven case studies to gain a clearer picture of the challenging conditions for female entrepreneurs in the tourism industry in Nepal. The tourism and trekking industries have potential to provide Nepali women with their own footholds in society. That’s according to CQUniversity researchers Dr Wendy Hillman and Dr Kylie Radel who have presented to other social innovation proponents from academia at the Ashoka U Exchange in Boston (in early April). The CQUni presenters have developed a grounded theory analysis of seven case studies to gain a clearer picture of the challenging conditions for female entrepreneurs in the tourism industry in Nepal. They say the women who have started a journey towards tourism entrepreneurship and personal emancipation have demonstrated great capacity and resilience, in the face of Nepal’s patriarchal customs and traditions. Women are often prohibited from the decisions of development and restricted to low-paid support roles. “The women we spoke to needed to encourage and provide the much-needed training and skills development that marginalised women throughout Nepal required to work in the tourism and trekking industries,” say the CQUni researchers. Dr Hillman and Dr Radel identified key themes that are crucial to longer-term success: Changing social impressions of women and girls; Self-dependence; The lack of support mechanisms for entrepreneurship as barriers; Two-way transformations; Branching out: and Women retaining control.